Have you ever seen a Moose? Do you want to? This nighttime pastime has become so popular that it has become one of the top things to do in New Hampshire, and nobody does it better than MWV Moose Tours in North Conway. Embark on this nighttime journey through the majestic White Mountains in an air-conditioned bus in search of the gentle giant of the North. Our nightly excursions feature a guided tour of the local area, moose videos and movies, and fascinating fun-facts about moose. Explore Moose Country after dark with the help of special floodlights and spotlights attached to the vehicles. There is a 94% success rate on spotting these large mountain animals during this bus tour and is a perfect adventure for the whole family. Tours are offered mid-May through early October, departs at 8 pm. Reservations are required. Where does the Moose Tour depart from? The MWV Moose Bus Tours depart from 40 Norcross Circle in North Conway Village, next to the Conway Scenic Railroad's Victorian train station, in New Hampshire's White Mountains. Located just 10 miles from the Grand Summit Hotel at Attitash, getting to the bus stop is a breeze. Go on this wild adventure after dark from mid-May through early October. The MWV Moose Tour is approximately 3-3.5 hours long from start to finish. Join the fun and embark on this wild adventure through the Notch back roads to spot these mountain creatures on an air-conditioned bus. 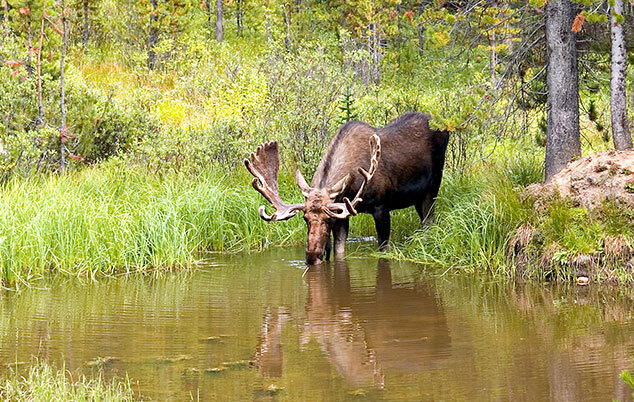 Enjoy a guided tour of the local area, moose movies, and interesting facts about the wildlife in NH. There is a restroom break about halfway through tour. All tours begin right after sundown, between 8 and 8:30 pm.